After a two-year break, the search for the most beautiful Boholana came to an end Friday, July 18, at the Bohol Cultural Center. There were 14 lovely and beautiful ladies giving the judges a tough time picking the winners. 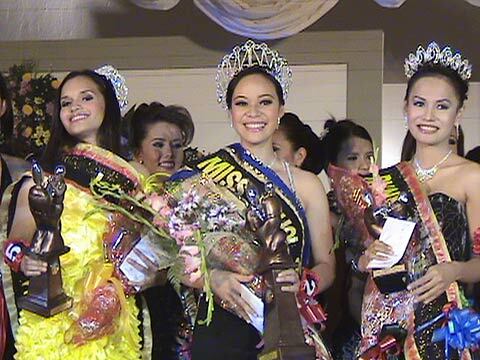 In the end, Joy Marie Maglajos representing Catigbian emerged as the new Miss Bohol Sandugo 2008 crowned by Miss Bohol Sandugo 2005 Anna Maris Igpit. Chandrina Elluiska Schreurs was declared 1st runner-up gathering most of the special awards, while Michelle Latras was proclaimed 2nd runner-up and the darling of the press. After declaring the winner, True had gathered them for an interview... once more answering to a grueling Q and A. They are not just gorgeous looking they make a lot sense. Joy Marie Maglajos - The oldest among the candidates who is 23 years old. 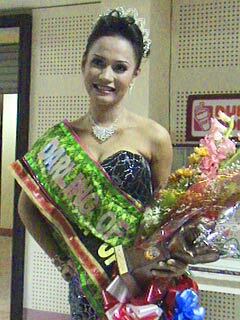 She was Miss Katigbawan 2006. She�s connected with PAL-Tagbilaran, and, tomorrow, she will be working with Cebu Pacific-Tagbilaran. She confesses that her guilty pleasure is eating. Her favorite is spaghetti specially prepared by her mom. She likes talong na torta. She doesn�t like �plastic� people, those who are talking behind her back. She was declared best in gown. Chandrina Elluiska Schreurs - She hails from Garcia-Hernandez town and is the eldest daughter of town Mayor. Ma'am Myrna Naldoza Schreurs. Chandrina or Chanchan has established herself as a beauty queen. She was Miss Bohol Wisdom Intrams 2006, Ms CVIRAA Tagbilaran City 2007, Ms CVIRAA 2007 4th runner-up held in Dumaguete City, Ms Nursing Sportsfest 2007 and Ms PYM 2007. She was declared best in festival costume and four minor awards from the sponsors. Michelle Latras - This young lass representing Talibon town is very articulate and very sweet. When asked what is something in her that she wants the judges to know more about, she answer with confidence that she wants the judges to know her as witty and intelligent because in pageants people usually associate the candidates as all beauty without brains. But it would be nice for us, she says, for someone to admire us by not what we look outside but for what we are inside. She was declared best in interview, Darling of the Press, best in swimwear and best in evening gown. Winning a beauty title can be radically life-changing. How do you think the Miss Bohol Sandugo title will change your life? Joy Marie: There are very big changes in my life especially that I am now working... and I don�t know yet of my schedule. Chandrina: I will be busier, since I�m also studying and SK chairman in our town. Yeah, I will have to be more conscious of my actions. Michelle: I think this is just the beginning...maybe following the footsteps of Miss Anna Maris Igpit. Joy Marie: The people of Catigbian. They inspire me a lot. Chandrina: Anna Maris Igpit because she is the first Boholana to win a Binibini crown and represented our country in the Miss World. She�s deserving of the title. Michelle: Anna Maris Igpit. She is really proud to be a Boholana. What is your best asset and why? Joy Marie: Just being my self... wherever I am, what ever I do, I�m just being myself. Chandrina: Smile. My smile brings encouragement to the people. Michelle: My smile. Giving your warmest smile you can really show to the people you�re sincere what you feel for them. Would you go for beauty or brains? Joy Marie: You can be beautiful if you�re intelligent. Chandrina: Brains. What is beauty if your brain is empty, right? Michelle: Can I choose both? I rather choose for brains. Even if you have the beauty but if your brain is empty...and having a brain with a good character you look beautiful in the eyes of the other. What is the essence of being a Miss Bohol Sandugo? Joy Marie: Being 23 years old, just be yourself... I believe in my self. I show to tem the real me. Chadrina: A role model and a goddess of beauty. Michelle: Sandugo festival is a celebration of treaty of friendship. If we will relate this to our present times, our country is facing problems, we should live the ideals if Sandugo�peace, brotherhood and friendship.. with that we would achieve our goals betterment of the Filipino nation. I will be a role model for life. These are some of our favorite and memorable lines from our candidates making our night complete. Host: If I will go to (name of town) asa ko nimo dad-on first? Host: If you were a pet or a domestic animal what would you be? Host: What is the thing you can�t live without? Host: If you were an animated superhero, who would you be and why? Host: If you were to be someone else who would you be? Host: What will you do? Host: How do you feel tonight? Are you nervous? P.S. My congratulations to Ms Baby Colins, the project director of this year�s Miss Bohol Sandugo, Kim, Dave Maulas, Alexis Cadeli�a, the pageant choreographer and Jerameel Decsa, te technical director and lights designer. 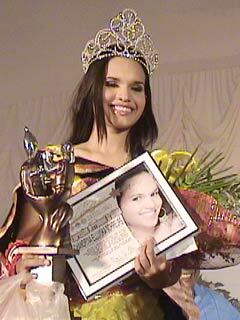 It was no doubt that the lass from Trinidad town would be the Miss Bohol Sandugo 2008 Miss Talent. When she appeared on stage to perform �balitaw,� Maria Angeli Cielo Cajes became an instant crowd favorite. It was not difficult for her to share her talent because singing is already in her veins. Nowadays, people might look down people who sing local folk songs like balitaw. The wide repertoire of Visayan songs includes ballads, lullabies, harana (serenade), children's songs, working songs, drinking songs, nonsense songs, and a lively song-and-dance debate called balitaw. Cielo�s rendention of Susan Fuentes 1980�s Mga Kinaham ni Lolo was not the usual singing of a balitaw. She is able to communicate much more intimately and subtly than singers who belt out tunes in the big, broad theatrical style. There she is, nose-to-nose with you. She can�t very well start mugging like a stage ham, when a half-smile or a wink would make her feelings clear. Her regal presence is pure elegance and charm. Cielo says that her knack for singing started when she was just a little kid. Her family are of balitaw singers. One can expect that when you visit her home in Trinidad, you might be surprised they are all experts singing balitaw. Balitaw is a song-and-dance debate between a man and a woman. More often sung than danced, it is a Visayan art form which existed in the region long before the Spaniards came. The early natives called the song oyayi and the dance baya-i. The Spaniards called the dance valse (waltz). The natives adapted the word valse to bal and added tawo (the Visayan word for 'people'). Thus was coined the term balitaw, meaning "dance of the people". Visayan debate songs, of which the balitaw is the best example, are usually sung at a festive gathering by a man-woman pair who must also be good dancers and actors. The examples that follow are jovial jousts on love and marriage. 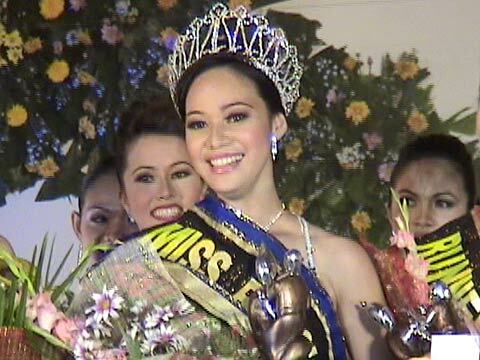 Cielo is best remembered for having the best talent in the Miss Bohol Sandugo history. I am so impressed with Ms Trinidad, Cielo Cajes. Wow, she�s great with Bol-anon songs. We need beauties like her who is cultured and proud of our Bisayan songs. Praises to her parents! I saw both pre and post-pageants. I thought Talibon's Michelle Latras was the winner. Best in swimsuit, evening gown, interview and darling of the press. She fumbled on the interview, but none of the other answers were impressive and some were downright stupid. Catibgian was one of the most boring candidates in my opinion. She didnt shine in anything. Chandrina E. Schreurs is from Garcia-Hernandez, not from Candijay. She is the eldest daughter of our town Mayor. Ma'am Myrna Naldoza Schreurs. Correction made, thank you for the information.--Jeroen. 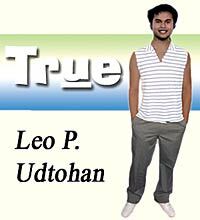 your comments on "True: Keeping a winning smile during a beauty pageant"